What’s the value of collaboration? In the news business, a traditionally competitive field where staff capacity is stretched thin and coverage gaps are widening, the answer isn’t always clear. Newsrooms and journalists may find themselves increasingly isolated as some outlets struggle against decline, and others race toward start-up and growth. The Colorado Media Project set out with a goal to evaluate the challenges facing local news, and explore ways to strengthen and connect the newsrooms serving our communities. Through this process, individual Colorado journalists and their organizations have engaged at every step—with an eagerness to collaborate, innovate, and engage more Coloradans in local issues. So in November, the CMP joined forces with the Institute of Nonprofit News to host a workshop with 16 Colorado media outlets—representing print, online, radio, and TV—from all around the state (and listed below). The goal? To surface opportunities for building a “value network” to support local newsrooms in Colorado. Journalists Dave Burdick (Editor, Denverite), Jennifer Hefty (Content Strategist, Ft. Collins Coloradoan), Richard Ballentine (Board Chairman, Durango Herald), Jake Brownwell (Membership Manager, KRCC/Southern Colorado), and Eric Gorski (Managing Editor, Chalkbeat) discuss their newsroom capabilities and collaborative opportunities. Lofty goals, yes—and so to ground things, Colorado journalists engaged in a full-day exercise in capabilities mapping. 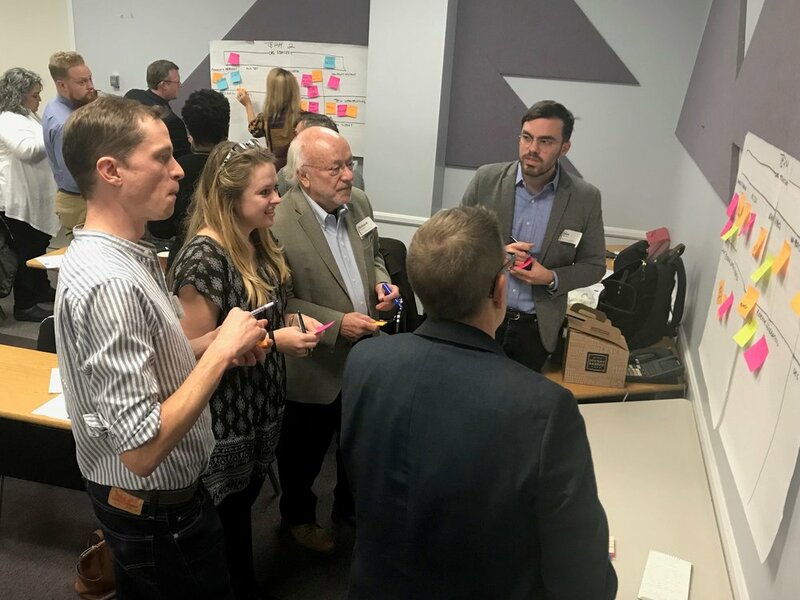 The group started by defining all the capabilities necessary to run an effective 21st century newsroom—from business strategy, to audience development, to tech infrastructure, to revenue generation, to community engagement, and more. Over hours of spirited discussion—involving several hundred sticky notes—groups sorted these capabilities into three categories: core capacities that they are great at and need to control, capacities they need to master but haven’t yet, and capacities they wish they could outsource. Audience development: Cross-promoting stories and/or sharing one another’s content (via newsletters or aggregation) can help individual outlets build audience and spread important stories. A value network might support distribution partnerships and content sharing in a more systemic, less ad hoc manner. Multimedia and tech innovation: A network approach could streamline access to talents that digital newsrooms know they need, but might not currently have in-house -- such as photography, video, audio, and data visualization, and web development. A digital asset management system—one of many resources INN is exploring—might facilitate use across multiple outlets. Public engagement: Galvanizing outlets to promote and host in-person events could amplify issues and deepen connections with communities, while spreading the burden for event planning and marketing. Revenue generation: Business development and fundraising capacity-building opportunities and implementation partners were in high demand. Grant research and writing, wealth screening, and corporate sponsorship/advertising sales all held promise for potential cost-sharing. Awareness/fundraising campaign: Participants envisioned developing and amplifying a common message about the value of public service journalism across Colorado, and the importance of local support for local news—much like what was piloted among seven Colorado newsrooms this year for #GivingNewsDay. Back-office infrastructure: Administrative and tech support, donation processing, database management, accounting, payroll, and other non-journalism-related services seemed ripe for sharing FTEs or contract support. With input from INN and other potential “value network” service partners, the CMP team is now synthesizing the outpouring of feedback from the event into next steps for 2019. In the meantime, if you have feedback on these or other ideas for supporting local journalism, we encourage you to reach out to us directly (info@coloradomediaproject.com), or join in the conversation on Twitter (@co_mediaproject). Thanks again to Laura Frank and Rocky Mountain PBS for hosting the event, and to the journalists who generously offered their time to participate, representing newsrooms far and wide. Thank you: Chalkbeat, Colorado Independent, Colorado Public Radio, Colorado Sun, Denverite, Durango Herald, Empowering Colorado, Fort Collins Coloradoan, Fresh Water News, High Country News, House of Pod, KRCC-Southern Colorado, KSJD-Four Corners, Longmont Observer, Open Media Foundation, and Rocky Mountain PBS.